When the original Thief came out, it revolutionised gaming in the future. For the first time, a first-person game really concentrated on the aspects of stealth, concealment, avoiding detection at all costs and most significantly, highlighting the danger of getting caught by making it very risky to fight even a single guard. For those of you who have no experience with any of the Thief games, allow me to give you a heads up of the priciples of the game. In a dark-ages style city (Called, creatively enough, 'The City') Garret, master thief, starts life as a homeless orphan picking pockets to stay alive. He is caught picking the pocket of a man who turns out to be a Keeper. Impressed by Garret's ability to spot him (Keepers pride themselves on staying hidden), the man offers Garret a new life. Though hesitant, he decides to be takin by the Keepers, and is trained in the art of stealth and concealment, staying silent and blending into shadows. Garret leaves the Keepers eveuntually and becomes a thief, using the skills he learned to become a master. Thus begins the events of Thief 1, the Dark Project. Drawing on the original Dark engine from System Shock 2, Looking Glass Studios pulled out all the stops in making an atmospheric game. Rather than having stealth as a useful tool, stealth became all-important. Being caught by a Guard usually meant a fight which is no easy task to win with only a sword. In addition, there was always the risk of the ruckus attracting attention and having a gang of enemies slashing away at you. To be seen usually meant a lot of trouble, unless you could escape and hide for a length of time. It was also the first game were sound became as vital as sight. You cannot expect to make your way quitely around a mansion at night, avoiding guards and sneaking up on them to knock them out if you can't hear anything. Guards mutter, mumble, grumble, whistle, talk about stuff with their peers and say stuff depending on what you have done (Hit a metal lantern with your sword and see how that guard around the corner reacts, or let off an explosive mine and expect all heck to let loose). When I first played the demo of Thief: The Dark Project, it was a pulse-pounding experience. You had to always keep an ear out for the footsteps and mutterings of guards, and if one came near, hop it quickly to find some handy shadows to lurk in. Fighting is incredibly difficult, especialy when they attract reinforcements in which case you are almost certainly doomed. This makes the player concentrate on stealth rather than say 'Oh bugger it,' and run out a-slashing when they feel like excitement. Not that they will need it. The game enhanced the atmosphere no end with journals, books, letters and memos and so on lying about to read, all allowing the player to get a feel for what is happening around them and in the City at large. Though a few contain subtle hints and tips, many simply helped the player absorb what was going on in a very effective way. 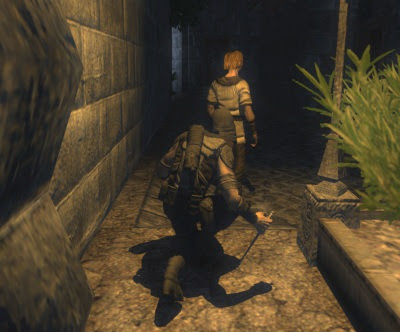 The game itself contained a great many tools for either killing (Fire arrows, mines), knocking out blackjack, gas arrows), distracting enemies (Noisemaker arrows and flashbombs), staying concealed (water arrows to douse torches, moss arrows to muffle steps over noisy metal/tile floors) or to help Garret reach new areas (Rope arrow and lockpicks). What is different in Thief: Deadly Shadows? The primary difference in Thief: DS is that, unlike its two predecessors, it no longer plays in set missions/levels. Garret, rather than being 'dumped into the mission area, or somewhere near it, now wanders the streets freely, able to both mug/ pickpocket the citizens he meets and burgle houses and shops he comes across. Any loot he picks up can be sold off in thief shops or 'fences', each one accepting two of the three kinds of loot on offer: Art, metal and gems. You cannot, say, steal a fabulous painting and have it magically turned into money. You must find an appropriate shop which will deal with it and sell it off. Then, and only then, will this loot turn into tradeable cash. Shops which sell specialised theif equipment, from the ever-so-familiar moss, water, fire and gas arrows to completely new stuff like oil (Causes people to slip up and can be set alight) and the useful wall-climbing gloves, giving a useful way of escaping or reaching new areas. However, you do not buy equipment prior a mission; you must buy it from a shop (one in each district) and then enter the mission by walking to the site. If you have to use up some of that precious equipment on your way there, like throwing off some City Watch men, then so be it. Also, a new and pretty cool, if somewhat superfluous feature is the third-person mode, which allows the player to see Garret in all his pixel-shaded, full 3D rendered glory. Complete with glow-in-the-dark mechanical eye. Although many may find it a plus point, my personal opinion is that the increased freedom has made parts of the game into tedious travelling across town, trying to find a fence to buy your stuff (You can't sell all kinds of loot at any one fence) and then looking for a shop with the stuff you are looking for (Not all shops sell the same stuff). Before, in the likes of Thief 2: Metal Age, you had a huge level to explore, obviously keeping hidden from the guards and locals, and generally many different paths to take through a level. In most Thief 3 levels, their is a fairly linear path to take, or else a number of paths, but you are channled into one due to enemies or such like. Also, each level tended to have a '' something to give it extra flavour, or set it apart from others. A good example would be the last level of Thief 2, Sabotage at Soulforge, where you had to actually manufacture certain devices to create an object to complete an objective. I have never seen that level of interactivity in any game before. And the Down the Bonehoard level in Thief 1 had many fiendish traps and very, very creative puzzles (for a game that old) that made it one of the most memorable levels I have ever played. Now, Thief 3 levels tend to be quite bland, concentrating on the main task of staying hidden, knocking out the bad guys and giving not-so-subtle hints about 'special loot' items on each level. The inclusion of 'special loot' takes it away from the down-to-earth stealth-em-up it once was, and introduces a (Dare I say it?) Zelda-like way of having bonuses and special items. Another point worth mentioning is that each mission is no longer one, gigantic level free for exploration. Now, each individual level and the City itself is seperated into zones (districts for the City). Each zone can be explored freely, but to properly explore a mission, you must eventually enter another zone of that mission, punctuating the missions with annoying load times between parts of the levels. Thief 3 tried to include a 'faction' system which includes trying to curry favour with the two main factions- the devoutly religious but zealously cruel Hammerites who worship the Master Builder and the symbols of masonry, construction and smithing, and abhor all things nature and natural. The other side being the ultra-secretive and elusive Pagans, worshippers of the nature-god the Trickster and of all things green and 'woodsy'. Obviously these two do not get on and at first, they will attack you on sight. By doing certain things (Killing rust mites and Undead creatures for Hammerites, shooting moss arrows at certain cornerstones and shooting altars with elemental arrows for Pagans)> By currying favour, they will stop attacking you on sight and will even jup to your defense if you get in bother with the Watch or are attacked in the streets. Besides this, there is nothing really interesting to do once allied with them, and doing favours for them becomes, at best, a chore to lesson your troubles later, when they come out and patrol the streets. Again, almost like the Gold Skulltula challenge of Zelda, this is no more than an irritating side-quest with no real reason to perform. I was hoping some entire missions would come about by performing these tasks, perhaps getting a non-story critical mission to bolster the cash reserves. As it is, there are none. What is good about Thief? After reading all that, you may get a bit discouraged. No, says I, Thief 3 is a decent game. The graphics are almost unparalleled. Besides Doom 3, I could honestly say Thief 3 has the best graphics I have ever seen. Lighting effects blow you away. An enemy holding a torch (A new thing for the thief series) casts a flickering glow. Opening and closing doors on light sources now shuts them out realistically, rather than having a cone of light shining through a closed door. Facial expressions are fantastic as well, with eyelid movements and mouthing of words being superbly accurate. The physics are much better too, when picking up and dropping bodies, they fall about realistically, and pile up on each other with arms dangling. They also slide down stairs (Helped along with oil, which is VERY funny). Make no mistake: Thief 3 is very atmospheric and the levels can be VERY scary. I will never forget when the statues come to life in the statue gallery, and muttering 'Must find, and kill and kill and find...' with heavy stone footsteps. Zombies make a return, being as frightening as ever, only this time they can run. Green gas pours out of the sides of the passages in the zombie-infested ghost ship, with chains hanging down and atmospheric 'music' playing softly in the background. And of course, who could forget the Shalebridge Cradle? This is quite simply one of the scariest levels I have ever played in my entire life, and I played it as a sixteen year old. The start of the mission has you looking up at the huge, manor-like cradle, and the first thing the came into my mind was 'The Haunting'. I won't spoil it for anyone who hasn't played this level yet, but be advised: It is NOT a level for the young. Even I lost sleep over this level. Is Thief offensive to Christians?